It’s fall again, which means turning leaves, schoolbuses getting in your way on your drive home, and sick conditions for outdoor climbing. It also means the inevitable return of the Triple Crown Bouldering Series. The Triple Crown in 2014 looks a little different than it did at its inception. It consists of four bouldering competitions in the Southeast – Hound Ears in Boone, North Carolina; Stone Fort (aka Little Rock City) in Chattanooga, Tennessee; Horse Pens 40 in Steele, Alabama; and Rumbling Bald in North Carolina. Thousands of people come from all over the country to pull down and cheer and play outside, and all of the money goes to access for even more climbing. I didn’t ask him myself, but when Jim Horton decided to raise money to keep one of his favorite climbing areas open, I doubt he had this in mind. The original “Triple Crown” consisted of three problems in the Hound Ears boulders, and a climber who completed all three got a bonus 50 points. That first competition, in 1994, had about a hundred climbers, and not many more problems. Last Saturday, both of those numbers had nearly quadrupled, and as those numbers go up, so does the number of dollars raised for climbing access. Access is one of the most important issues facing climbers. Many of the best lines are on private land, and landowners don’t always want to allow climbers onto their property. Organizations like the Access Fund, Southeastern Climbers Coalition, and Carolina Climbers coalition raise money to purchase land to develop as climbing areas, or to negotiate access with the landowners. There is no such thing as too much fundraising for access. Grandfather Campground in the sunshine. 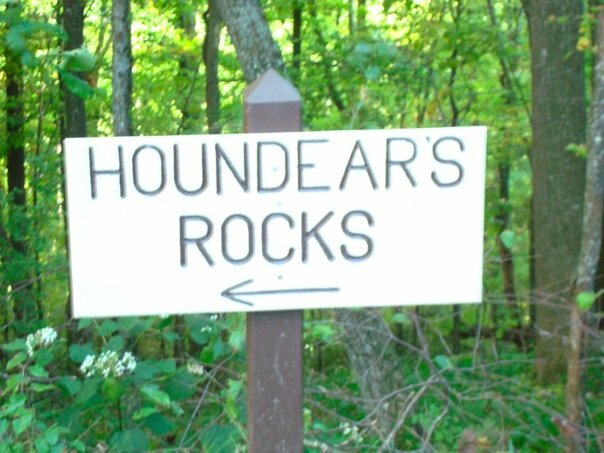 Hound Ears golf club is an interesting location for a competition because it is closed 364 days a year. Nobody has the boulders dialed; it’s a level playing field. As a result, the rock is pristine, and incredibly sharp, and nobody has beta more recent than a year old. Jim gained access by asking nicely – not all landowners are money-grubbing jerks – and with one hiccup last year, the Hound Ears community has opened their gates to us every October. They don’t get any money from the event; they just help us make it happen. 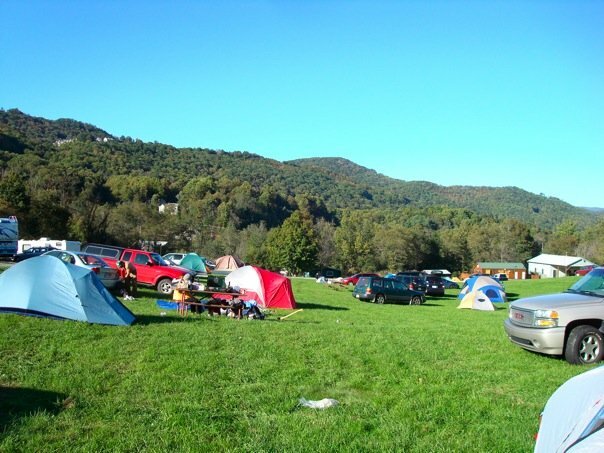 The Triple Crown kicks off here every year, with camping at a festival full of vendors and swag and prizes and occasionally free beer. It’s an annual gathering of climbers who want to climb hard and make a difference in their community. This photo is a few years old but the vibe hasn’t changed much. And me? I went up a mountain and fell off of some classic boulder problems. I rediscovered my love for climbing outside, and hanging out with climbers, and having chalk thrown at my head, and all of the other things that come with a competition. I rediscovered my love for the community that gets together just to climb, that has a collective awareness of the importance of funding access, and that sees value in the falls as much as the sends. I’m not sure if I’ll make it to another Triple Crown event this fall, but if you can get out, you absolutely should. There’s no such thing as “not in shape” because the point isn’t to send everything; it’s to have fun and play outside and do something you may have never done before. 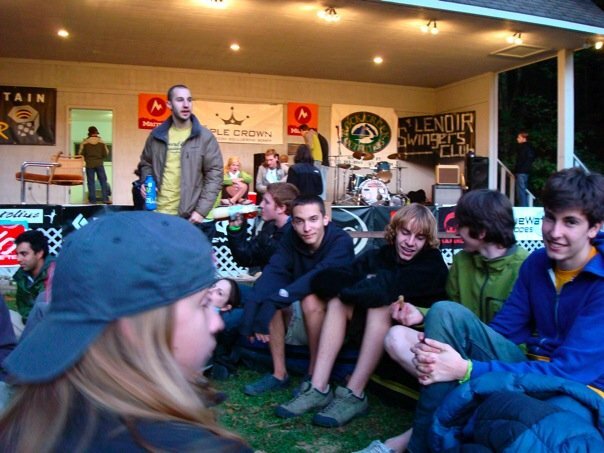 For more information about the history of the Triple Crown, check out this interview with Triple Crown Bouldering organizers Jim Horton and Chad Wykle. It’s a pretty awesome read about some pretty awesome guys. If you’re going to be at any of the next three Triple Crown events, and are interested in writing about your experience, contact me at erin@peakexperiences.com! This entry was posted in Competition, Events, Outdoor Climbing and tagged Bouldering, competition, Friendship. Bookmark the permalink.